"We woke up the next day and were eager to eat before starting the tour, so we set off to a restaurant for breakfast two doors down from our hotel, in doing this we missed our pick up!! nightmare, luckily the company where really helpful and the bus came and picked us up, so off we go for around a 45 minutes drive to the first tomb, would go into detail but we did 5 of them so you would get bored, I will however say the architecture is absolutely incredible. The fact they were able to produce places like these in times where they didn’t have the advance machinery we have today would be incredible to see what it would be if they did have that technology available to them, some of the tombs took years- decades to make. I think one of my favorites was the Tomb of Tu Doc, the peacefulness of this place alone is beautiful, if you’re ever going through hue at least see this amazing place." Hué - is the ancient imperial capital of Vietnam. The imperial palace in the city is a replica of the Forbidden City (Purple Forbidden City) in Beijing. During the Tet Offensive in the Vietnam War, there was heavy fighting in the city between US Marines and South Vietnamese army on one side and the Vietcong and the North Vietnamese army on the other side. In these battles the imperial palace was largely destroyed. Giang Huong, the Perfume River divides the city into two parts. On the north-eastern shore lies the Forbidden City, with imperial palaces. On the southwest shore stretches the new town out with a strong French colonial atmosphere. Hue has from all the Vietnamese cities managed to keep most of the Vietnamese identity. It is also a city of poets, philosophers and musicians. There is much to visit in Hue: from tombs to the Forbidden City. Below is a list of landmarks in Hue. You also have the opportunity to sunbathe at one of the most beautiful beaches in Vietnam with clear blue ocean and white silky sand. Thuan An and Lang Co beach belong to the most beautiful beaches. 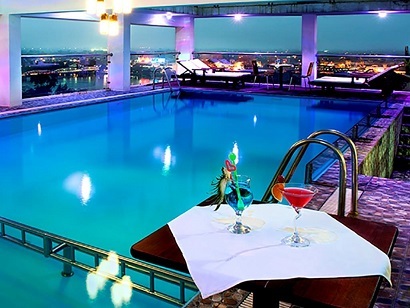 Moreover, there are near Hué a number of mineral hot springs, like Thanh Phong Tan An, Phong Dien. Here tourists can relax after a long walk. There are travel agencies in the city who organize boat trips on Perfume River. During this cruise you can enjoy the scenery, a Vietnamese meal and there are performances on board. Citadel (with inside the King City) This is located on the northern bank of the Perfume River, just a short walk away. At the entrance of the Ngan gate to the Citadel, are the Nine Holy Cannons cast from molten bronze objects from the Tay Son dynasty. The guns are named after the four seasons and the five elements (metal, earth, wood, water and fire) and are known as the "Holy Invisible Generals". They are never used for military purposes and watch over the Citadel. .
Hué Festival is a collection of events and activities. This cultural festival is held annually in the spring and lasts over a week. The festival attracts over a million visitors. There are traditional concerts, dance and theater performances, art and calligraphy exhibits, games and special tour programs for tourists. Some people visit temples and sacrifices, which are also performed traditional dances. The Hue Festival often ends with fireworks. Japanese Bridge: This is so called because of its resemblance to the Japanese bridge in Hoi An. Its construction was started by Tran Thi Dao, the wife of a senior mandarin at the court of Emperor Le Hien Tong, somewhere between 1740 and 1746. Originally, this bridge was built for a better transport and communication of the village, on both sides of the channel lag. 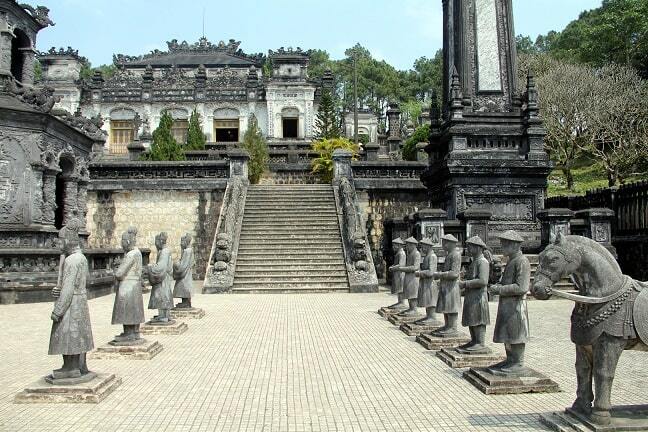 In 1925, Emperor Khai Dinh ordered the villagers to build a shrine on the bridge, which was dedicated to Tran Thi Dao. Many people still travel to the bridge to visit it. 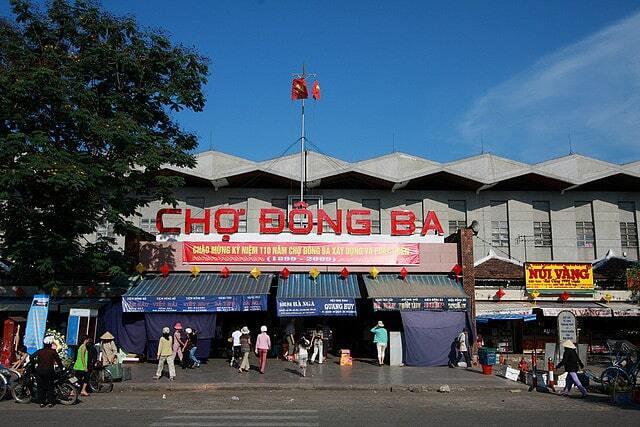 Cho Dong Ba Market: This is the largest market in Central Vietnam. It is definitely a place to visit and immerse yourself in the local culture. 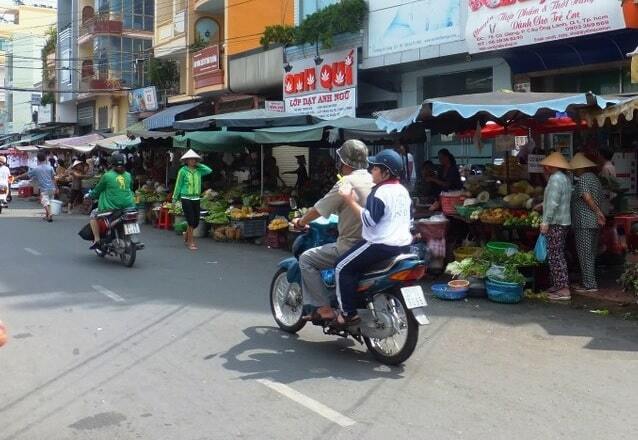 Tourists can experience everything, to offer a traditional Vietnamese market, as the sampans, a bus station and bazaars. Dong Ba market is considered a paradise for those who want to take photos of the daily activities, but also to shop for souvenirs to bronze objects: Hue sesame candy, conical hats, just to name a few. Have you after the market interest in Vietnamese food, you can also go there.